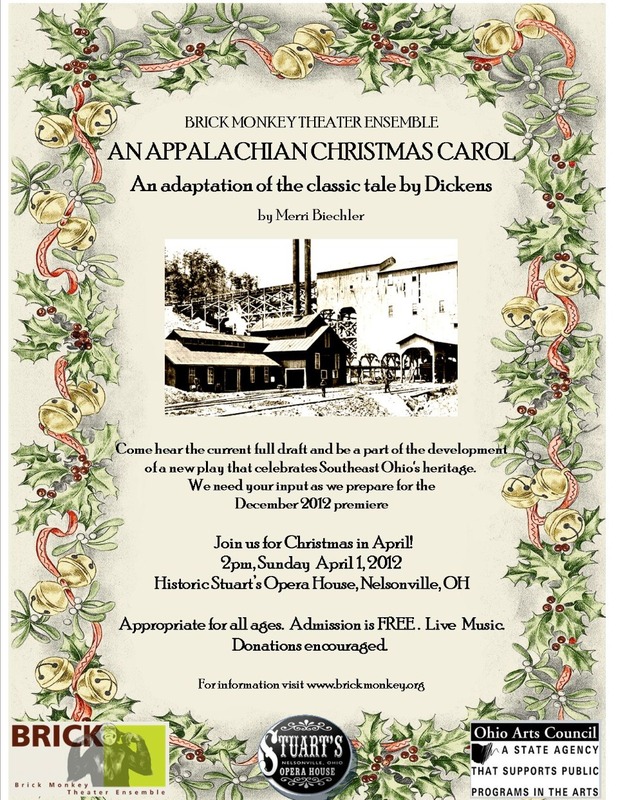 ATHENS, September 10, 2012 – Brick Monkey Theater Ensemble (BMTE), Southeast Ohio’s professional theater company, is proud to announce the performance dates of An Appalachian Christmas Carol and the inauguration of a local Holiday Tradition. The premiere production of this new – and newly relevant to our region – adaptation of the Charles Dickens’ Christmas classic will run Thursday through Sunday, December 13 – 16, 2012 at Stuart’s Opera House in Nelsonville. Written by company member Merri Biechler, this production is the culmination of two years of development and research that has included extensive community input. BMTE is proud to be supported by the Ohio Arts Council, the Athens Foundation, the Athens County Convention and Visitors Bureau, and the O’Bleness Foundation. Spinning the traditional ghost story and tale of redemption, An Appalachian Christmas Carol honors Southeast Ohio’s rich coal mining and labor union heritage, while simultaneously celebrating the spirit of the season. BMTE is taking this beloved classic and moving it to our own backyard: a Southeast Ohio Mining Town where old Eb Scrooge owns the mine. This is a joyful story of redemption, rooted in rural storytelling and intertwined with regional traditional music, played live by local favorites, members of the Rattletrap Stringband. For An Appalachian Christmas Carol, Stuart’s is as much a character as a performance venue, and was chosen for its vibrant past and its intimate connection to the history of the region. Brick Monkey Theater Ensemble Presents An Appalachian Christmas Carol, accompanied by members of the Rattletrap Stringband. Stuart’s Opera House, on the Public Square in Nelsonville, Ohio. Thursday, December 13 at 7:00 PM; Friday, December 14 and Saturday, December 15 at 8:00 PM; Sunday, December 16 at 2:00 PM. Tickets will go on sale at Stuart’s Opera House closer to the event. Brian Evans (Actor, member of Actors Equity Association, Screen Actors Guild/AFTRA) is an assistant professor at Ohio University’s School of Theater. He has performed at theaters including South Coast Repertory, Human Race Theatre, CATCO, Porthouse Theatre, and the Colorado, Illinois, and Oxford Shakespeare Festivals. Independent film credits include Urban Pill and Play Yourself. On television, Brian appeared on Judging Amy, and Chappelle’s Show. Janice Paxson Evans (Actor, member of Actors Equity Association, Screen Actors Guild/AFTRA) performed the roles of Titania in A Midsummer Night’s Dream and Ruth in Pirates of Penzance for the Oxford Shakespeare Festival. In Los Angeles, favorite roles include Rose/Sheila in Elephant Stageworks’ production of 7 Redneck Cheerleaders, Nessa in Goodbye Freddie at the Hollywood Actors Theatre and Gertrude in Fortinbras at the Stella Adler Theatre. Andy Felt (Director) Andy hails from sunny southern California where he received his BA in Acting from CSU San Bernardino, served as the Resident Assistant Technical Director of CA Riverside Ballet, was the founding Artistic Director of Shakespeare in the Garden (San Bernardino), and served as the Resident Managing Director of The Imagination Company (Los Angeles). Andy received his MFA in Directing from Ohio University in 2009. Favorite directing credits include The Tempest (OU), Dracula (Monomoy Theater), Romeo and Juliet (Redlands Theatre Company), and Othello (San Bernardino, CA). Andy is an Assistant Professor of Theatre at Marietta College, OH. David Haugen (Actor, member of Actors Equity Association, Screen Actors Guild/AFTRA) is a member of the Performance Faculty at Ohio University.He has studied with master teachers William Esper, Maggie Flanigan, Sonia Moore and the character actor, Albert Salmi. As an actor, David has worked in film (Vision Quest; The Curious Profession of Jonathan Hoag), television (Law & Order, Law & Order SVU, Ed,) and off-Broadway in Romeo & Juliet. C. David Russell (Scenic Designer) Mr. Russell’s varied career includes costume and scenic design, costume and property crafts, event design and project management. Mr. Russell is the resident designer for The Enchantment Theatre Company in Philadelphia. He is the Master Props Craftsperson at The Santa Fe Opera. Mr. Russell holds a BFA from Ohio University School of Theater and a MFA in Costume and Scenic Design from NYU, TISCH School for The Arts. Lorraine Wochna (Actor) lived in NYC for 20 years where she co-produced a yearly play festival for women, performed Elvis and Eleanor a solo piece by Mark Dunn, worked with Ensemble Studio Theatre, Primary Stages and many other Off and Off-Off Broadway theatres. Members of the Rattletrap Stringband. Posted in Uncategorized on September 28, 2012 by Erik Ramsey. Click poster to view full size. The Monkeys invite you to celebrate Christmas in April. No, it’s not an April Fool’s Day joke! Just the next step in the development of our original work An Appalachian Christmas Carol. As many of you know from attending past Brick Monkey readings of new plays, a large part of the writing process entails hearing the material out loud in front of an audience to determine what works, what’s confusing, and what should be expanded. So we need your help! Sunday, April 1, 2012, at 2pm at Stuart’s Opera House. The event will be a seated, script-in-hand reading of the play with live music. For those of you who heard Act One back in December, this will be an opportunity to hear the rest of the story. If this is your first time to see it, your feedback is important as well, as we continue to develop the production over the coming months. The reading is FREE, but donations are always welcome. Coffee and cookies will be served. Brick Monkey Theater Ensemble’s production of An Appalachian Christmas Carol will have its premiere this December at Stuart’s Opera House. Don’t miss out on this exciting opportunity to tell our region’s story. It promises to be the beginning of family holiday tradition! Posted in Uncategorized on March 23, 2012 by Erik Ramsey. Happy Valentine’s Day from the Monkeys! Join us tonight at 7:30pm for a free play reading at the Dairy Barn Arts Center. We will be presenting a different play tonight than originally advertised: Steven Dietz’s comedy Shooting Star. Snowed in overnight at a middle-America airport, college lovers Elena Carson and Reed McAllister have an unexpected and life-altering reunion. “Steven Dietz sends a tender valentine to middle-age in SHOOTING STAR, a smart and sweet comedy from one of the American theater’s most-produced playwrights. Dietz’s gift as a writer is an acute attention to our modern language. He elevates ordinary conversation to a kind of music. Dietz makes reality poetic.” —Austin-American Statesman. The reading is directed by Rebecca VerNooy and features Janice Paxson Evans and Brian Evans. Come join us for a great play, cookies and coffee (or something from the bar), as we celebrate Valentine’s Day Brick Monkey style! WHERE: The Dairy Barn Arts Center, 8000 Dairy Barn Lane, Athens, OH. Posted in Uncategorized on February 14, 2012 by Erik Ramsey. You can now donate directly to BMTE through the web! Not only that, you can donate just like you do for NPR — small, automatic monthly donations — and you can get all the reporting forms for your taxes emailed to you directly. Won’t you join us in donating $12 a month in 2012? The “$12 in ’12” program proceeds go to supporting our popular monthly new play reading series (no admission fees) and toward our full production of Appalachian Christmas Carol in December 2012, the first act of whichwas very well received this past December at Stuart’s Opera House. (Of course you may choose to support us at $15 or $50 or $150 a month if you like — we won’t be upset if you break the $12/month barrier, we swear!) Also, stay tuned: there will be special benefits to becoming a “$12 in ’12” member, such as “first look” previews of the 2012 full rendition of Appalachian Christmas Carol and other “Inside the Process” sneak peeks. To donate (either a one time donation or on a monthly basis) simply click the button above and follow the instructions, or go to the support page. Network For Good, the donation processor, is also a not-for-profit entity; they make sure that 100% of your donation goes to BMTE. Posted in Uncategorized on January 12, 2012 by Erik Ramsey. 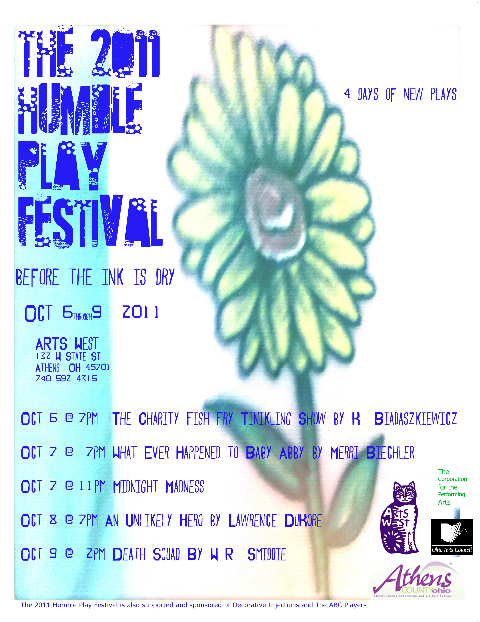 Brick Monkey Theater Ensemble is thrilled to be participating for the third year in The 2011 Humble Play Festival. Festival organizers Kelly Lawrence and Emily Prince have done an amazing job of bringing together the Athens theater community to produce a weekend of new play readings at ARTS/West. You’ll have the chance to see readings of four new plays from playwrights from around the country. All events take place at ARTS/West, 132 W. State Street in Athens, OH. The readings are free and begin at 7pm Thursday, October 6th through Saturday, October 8th, with a 2pm matinee on Sunday, October 9th. What Ever Happened to Baby Abby? 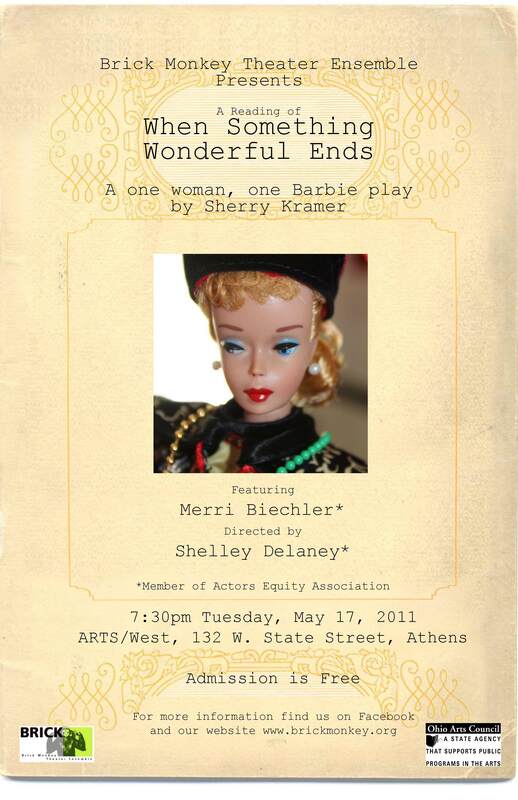 by company member Merri Biechler will have a reading on Friday, October 7, 2011 at 7pm. The comedy is about a young woman who discovers at age 27 that she was a famous baby, but feels she hasn’t lived up to society’s idea of a worthwhile life. The reading features Emily Auwaerter, Karen Chan, Casiha Felt, Jonathan Silver, and Matt Van Slyke. Death Squad by W. R. Smiddie will have a reading on Sunday, October 9, 2011 at 2pm. The play examines the events that led to a terrible massacre in El Salvador in 1981, aided and abetted by the American government. The reading features company member Brian Evans among the cast. This year’s festival is dedicated to Mr. Smiddie who passed away earlier this year. Bob was instrumental in the birth of the play festival and is sorely missed. Each selected play will be presented as a reading. A reading is defined as actors presenting the words of a script, using scripts-in-hand. Each reading will be kept extremely simple so that the playwright’s words may be the focus of the event. All readings will be followed by a moderated talk back session where audience members are invited to give their feed-back on the plays. Come out and support new play development in Athens County! Check out Humble Play and ARTS/West on Facebook and Twitter. Many thanks to the The Ohio Arts Council and the Humble Play Committee for making this festival possible. Posted in Uncategorized on September 30, 2011 by Erik Ramsey. Many of you were in the audience at Stuart’s Opera House on September 11, 2006, for the first Brick Monkey Theater Ensemble reading of The Guys by Anne Nelson. The play documents the story of New York Fire Chief Nick Flannigan in the aftermath of 9/11. Our audience talk-back session that night was filled with personal accounts of the attacks, as audience members recounted where they were when the towers fell. Emotions still felt raw on that night five years ago. And here we are. Ten years since the events of 9/11. While some things remain the same, many have been forever changed, and those raw emotions have morphed into…what exactly? Media exhaustion? Rage? Frustration? Fear? Hope? All of the above at different times? We want to hear from you, our audience. Where are we as a nation, as a community, ten years later? 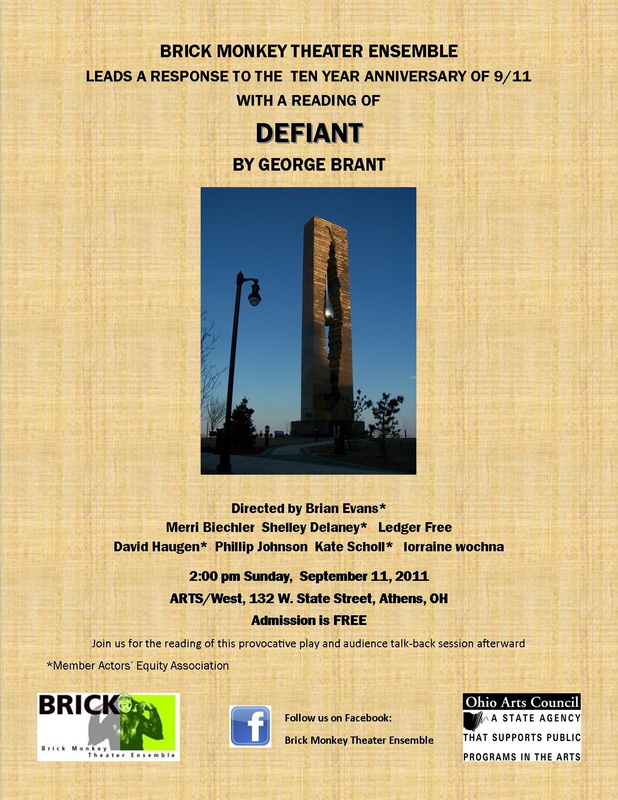 We are excited to bring you the next installment of our Free Play Reading Series, Defiant by George Brant. George is a gifted playwright who has recently moved to Cleveland after many years on the East Coast. The Monkeys are big fans of his writing and we are excited to bring a play reading of his to Athens. Defiant tells the story of Ann Martin, a woman who incurs the wrath of a grieving country when she refuses to memorialize her husband following his death in a national tragedy. The play is a beautifully crafted Greek tragedy that asks difficult questions about what it means to grieve, what it means to be a patriot, and how a decision to not honor the dead can be seen as treasonous. Presented by Brick Monkey Theatre Ensemble, Southeast Ohio’s professional theater company, the reading will be directed by company member Brian Evans, and features Merri Biechler, Shelley Delaney, Ledger Free, David Haugen, Phillip Johnson, Kate Scholl and lorraine wochna. Dr. William Condee will facilitate an audience talk-back after the reading. The reading will take place at 2pm on Sunday, September 11, 2011, at ARTS/West, 132 W. State Street, Athens, OH. Admission is free. Refreshments will be served. Come join us for an afternoon of thought-provoking theater and discussion! George Brant’s scripts have been produced and developed internationally by Trinity Repertory Company, the Cleveland Play House, Dobama Theatre, the Playwrights Foundation, Premiere Stages, the Playwrights’ Center, WordBRIDGE Playwright’s Lab, Trustus Theatre, the Drama League, Florida Studio Theatre, Terrific New Theatre, the Elemental Theatre Collective and the Disney Channel, among others. His script Elephant’s Graveyard was awarded the David Cohen National Playwriting Award from the Kennedy Center and the Keene Prize for Literature. He has received writing fellowships from the MacDowell Colony, the Blue Mountain Center, the Djerassi Resident Artists Program and the Michener Center for Writers, as well as commissions from Dobama Theatre and Theatre 4. His plays are published by Samuel French, Smith & Kraus, and Broadway Play Publishing. Posted in Uncategorized on September 3, 2011 by Erik Ramsey. Part of the fun of the Reading Series is revisiting a play at different stages of its development. Sherry Kramer is a longtime friend of the MFA Playwriting Program at Ohio University. When she served as a playwriting mentor at the 2005 Seabury Quinn Jr., Playwrights’ Festival, she was writing When Something Wonderful Ends. Typical of Sherry’s generous spirit, she allowed Shelley Delaney to direct a public reading of this one woman show with SEVEN actresses! The play went on to have its world premiere at the Humana Festival of New American Plays at the Actors’ Theatre of Louisville in 2007, and has had numerous productions worldwide since then. This is an autobiographical play for Ms. Kramer. After the death of her mother, Sherry’s family home goes up for sale. Sifting through memories of a seemingly simpler time as she packs up her baby-boom childhood, Sherry begins to connect the dots between her Barbie collection and America’s place in the rest of the world. A touching, funny, deeply personal and daringly global one-woman, one-Barbie play. The reading will be presented by the Brick Monkey Theatre Ensemble, southeast Ohio’s only professional theater company, directed by Shelley Delaney and featuring Merri Biechler. Where? ARTS/West, 132 W. State Street, Athens, OH. Sherry Kramer’s work has been seen at theaters across the country and abroad, including the Humana Festival at the Actors Theatre of Louisville, Yale Repertory Theatre, Soho Rep, Ensemble Studio Theatre, New York’s Second Stage, Woolly Mammoth, and The Theater of the First Amendment. She is a recipient of NEA, New York Foundation for the Arts and McKnight Fellowships, the Weissberger Playwriting Award, and a New York Drama League Award (What A Man Weighs), the LA Women in Theater New Play Award (The Wall of Water), and the Jane Chambers Playwriting Award (David’s Redhaired Death), and a commission from A.S.K. (The Mad Master). She was the first national member of New Dramatists, and teaches playwriting at Bennington College, and in the MFA programs of the Iowa Playwrights Workshop and the Michener Center for Writers, University of Texas, Austin. 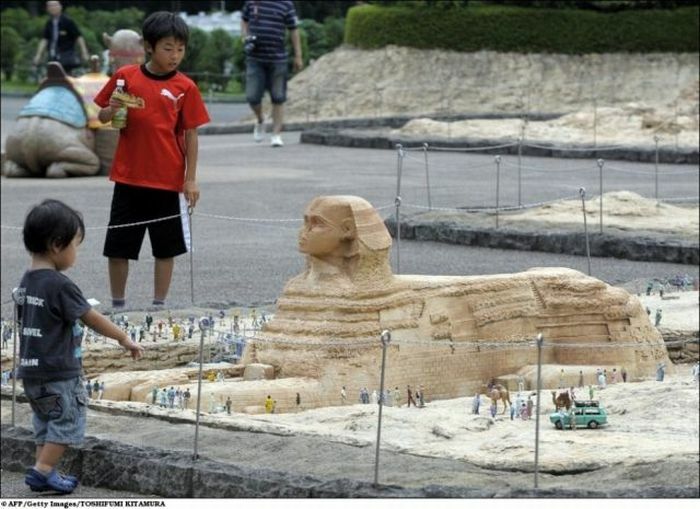 Posted in Uncategorized on April 28, 2011 by Erik Ramsey. Like many of you, the Monkeys were saddened by the passing of Elizabeth Taylor. While Ms. Taylor might have been better known for her romantic entanglements, her collection of diamonds, and her fundraising for AIDS when most celebrities wouldn’t be associated with the illness, we want to remember her as the talented, risk-taking actress she was.We wondered: how best can we honor Liz? By raising a glass in her memory? By revisiting a play that made her famous? How about both! Come join Brick Monkey Theater Ensemble for our next free public reading of Who’s Afraid of Virginia Woolf? (Click on the flyer to see it full sized.) The play, written by Edward Albee in 1961, has been described as one of the most important plays of the last 100 years. It is a ruthless account of two marriages and the dangerous game they play one evening at a party. The barbs and booze fly as George and Martha tear into each other, but as the evening progresses we discover the painful wounds their destructive games protect. Newsweek called the play “a brilliantly original work of art–an excoriating theatrical experience, surging with shocks of recognition and dramatic fire that will be igniting Broadway for some time to come.” Considering that statement was made fifty years ago, I’d say they were right! The reading will be presented by Brick Monkey Theatre Ensemble, southeast Ohio’s professional theater company and will feature company members Dennis Delaney and Shelley Delaney, together with Beth Brown and Chris Young. 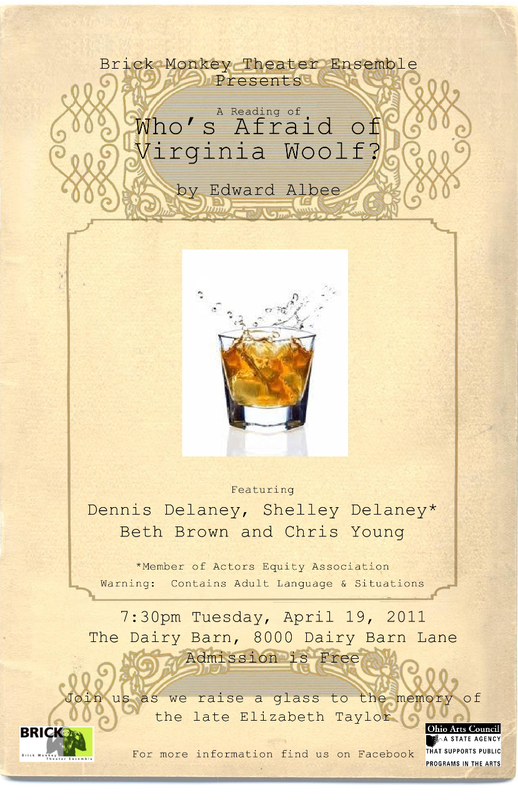 To honor the late Elizabeth Taylor, join Brick Monkey for a free reading of Who’s Afraid of Virginia Woolf? by Edward Albee. Posted in Uncategorized on April 15, 2011 by Erik Ramsey. Brick Monkey Theater Ensemble wants to brighten your post-daylight-savings-time evening with a free play reading! November’s offering will be company member Erik Ramsey’s Lions Lost (in Translation). Originally developed at WordBRIDGE play lab, Cleveland Public Theater, American Stage, and the Tony Award-winning Victory Gardens Theater in Chicago, the play follows Professor Bloy who suffers from a very literary ailment: he has become a metaphor of himself. He hunts a cure from a list of specialists: from the family physician, to a science fiction writer best known for his portrayal of the sexual habits of robots, to the Latina bricklayer next door. In the end, exhausted by his search, he must bring his illness to the supper table where his fading wife awaits. The reading will be presented by the Brick Monkey Theatre Ensemble, southeast Ohio’s professional theater company. The reading will be directed by ensemble member Shelley Delaney and will feature Beth Brown and ensemble members Dennis Delaney, Brian Evans, David Haugen and lorraine wochna. The reading will take place at 7:30pm on Tuesday, November 16, 2010, at Glidden Recital Hall on the Ohio University campus. Admission is free. Erik Ramsey is an Associate Professor of Playwriting who teaches with Charles Smith in the MFA Playwriting Program, and is Head of Undergraduate Playwriting at Ohio University. His plays have been produced around the country, and Samuel French and Dramatic Publishing have published several of his short works. Currently, he is writing a trilogy of historical dramas about the surprising turn of events that boosted Joseph Smith from life as a small time con-artist to Prophet of the Mormon Church; the first in the series, titled SMITH UNEARTHED, has recently been featured and developed at the International Society of Contemporary Literature and Theatre Conference (Estonia: 2007), the Gwen Frostic National Reading Series at Western Michigan University (Nov, 2008), and at Brick Monkey Theater Ensemble (Dec, 2008). His two textbooks, “The Art of Theatre: Then and Now” and “Experiencing the Art of Theatre” are in their second edition from Wadsworth (2010), and are in use at over 100 colleges and universities nationwide. In 2007 Erik was named a Kennedy Center Faculty Fellow for his work in new play development and in 2010 he was appointed as Director of Innovation, Research and Theory for WordBRIDGE Playwrights’ Laboratory. This past September he taught master classes in playwriting and play development technique at Lubimovka Playwrights Laboratory in Moscow, Russia. Posted in Uncategorized on November 16, 2010 by Erik Ramsey. Brick Monkey Theater Ensemble is back from summer break and ready to present another free play reading! 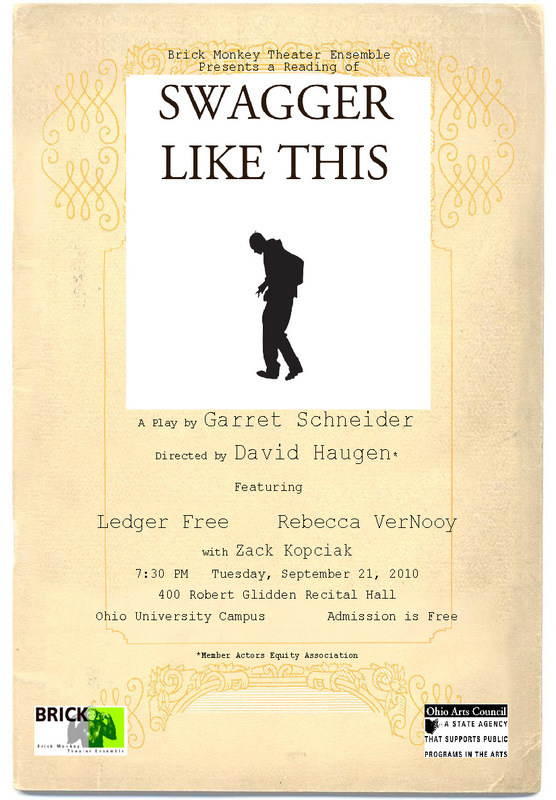 September’s offering will be Garret Schneider’s play Swagger Like This. Part of Brick Monkey’s mission is to develop new plays. When we saw this play read in the 2009 Ohio University Seabury Quinn, Jr. Playwrights’ Festival, we were moved by the courage and joy of the lead character…Jonah. Jonah is an 8th grader with a speech impediment, a physical handicap, and a burning need to rap in his school’s talent show. Yet, his greatest obstacles to rap-stardom don’t come from his newly-formed ‘crew’ or from his disability, but rather from his parents who desperately want him to succeed. The reading will be presented by the Brick Monkey Theatre Ensemble, southeast Ohio’s only professional theater company. The reading will be directed by ensemble member David Haugen and will feature ensemble members Ledger Free and Rebecca VerNooy, and Zach Kopciak. Posted in Uncategorized on September 14, 2010 by Erik Ramsey. 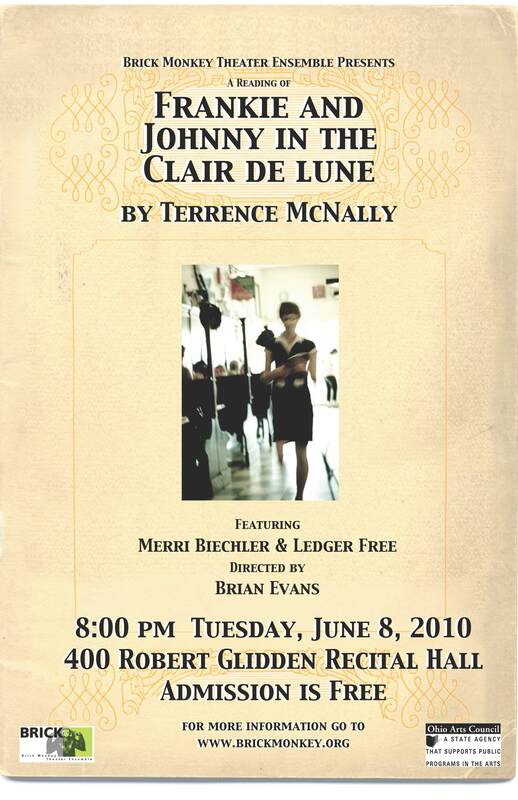 Frankie and Johnny in the Clair de Lune is the final offering in Brick Monkey’s series of free play readings. Terrence McNally’s gem of a story asks the question: Can a middle-aged waitress and short order cook, who’ve experienced more disappointments than delights in life, find true love? The original 1987 Off-Broadway production starred Kathy Bates and Kenneth Welsh. The play finally got its Broadway debut in 2002 with Edie Falco and Stanley Tucci in the title roles. Since several Monkey company members enjoyed one or the other of the NYC productions, this play easily fits into our “plays we love” category! We hope you will join us for what the New York Post calls a “very sweet, extraordinarily funny, romantic and ribald comedy.” The reading will be presented by the Brick Monkey Theatre Ensemble, southeast Ohio’s only professional theater company. Join us afterwards for an audience discussion of the play. Posted in Uncategorized on June 8, 2010 by Erik Ramsey. Part of Brick Monkey Theater Ensemble’s mission is to develop and produce new plays. With three playwrights in the company, audiences have the rare opportunity to see professional theatrical works in their very early stages. Because theater is such a collaborative process, a play doesn’t really become a play until it is up on its feet, with actors, a director, and designers, in front of an audience. As theater artists, we consider the audience an invaluable part of the process! And we want to invite you to join us in this process. OCCUPATION takes place in America. When, after a coordinated terrorist event, fear has persuaded us to trade in our personal freedoms for security. An underground movement of young women calling themselves Civilians are strapping bombs to their backs and blowing up Government Officials. Bombs are the new black. Someone has to bury these dead girls. Someone has to stand up for the Government Officials. And someone has to tattoo the girl’s identity to her foot before she makes her delivery. OCCUPATION, written by Brick Monkey Theater Ensemble’s Managing Director Merri Biechler, will be directed by Emily Prince and will feature ensemble members Janice Paxson Evans, Kate Scholl, Rebecca VerNooy, and Lorraine Wochna. A one-act version of the play was a finalist in the Perishable Theatre’s International Women’s Playwriting Festival, and was workshopped with Ohio University BFA actors in May 2009 under the direction of company member Shelley Delaney. The Brick Monkey reading of Occupation will be the first public presentation of the full-length version of the play that is still in development. Posted in Uncategorized on May 11, 2010 by Erik Ramsey. 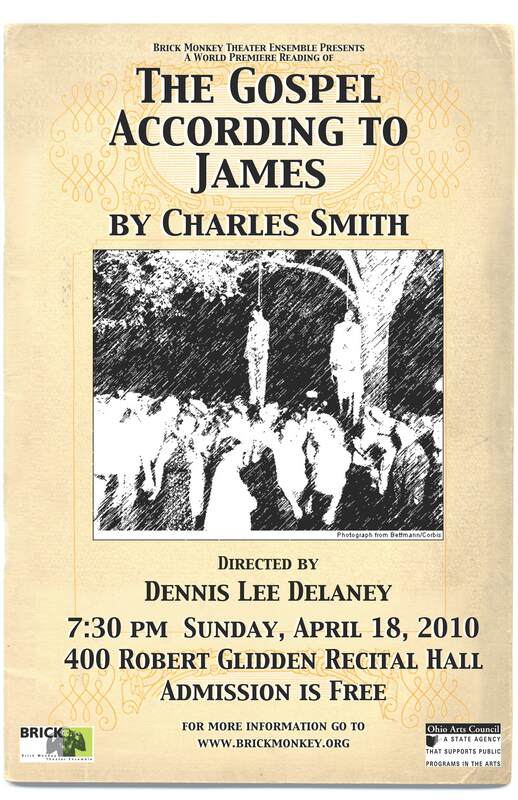 The Gospel According to James by Charles Smith, is based upon the August 1930 double lynching in Marion, Indiana that has been immortalized by the now iconic Lawrence Beitler photograph. The play depicts a fictional meeting between the man who survived the double lynching, James Cameron, and the woman who claimed to have been raped but later recanted, Mary Ball. As they recount the events of that night, the play uses the lynching as a fulcrum to explore how shifting memory has created what we now understand to be an immutable history. The play will receive its World Premiere production at the Indiana Repertory Theater in March of 2011 and will receive a subsequent production by the Tony Award-winning Victory Gardens Theater in Chicago in May of 2011. Posted in Uncategorized on April 18, 2010 by Erik Ramsey. 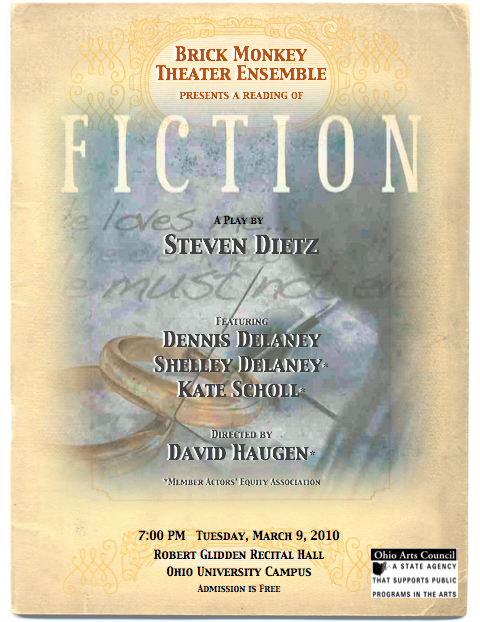 Brick Monkey Theater Ensemble is proud to perform a staged reading of Fiction by Steven Dietz. Actors: Dennis Delaney, Shelley Delaney, Kate Scholl. Location: Glidden Recital Hall on the Ohio University campus. Posted in Uncategorized on March 3, 2010 by Erik Ramsey.